Billionaire investor, worth $62B in 2008. Warren Buffett bought his first stocks at age 11 -- three shares in Cities Service Company, now known as CITGO. He also sold soda pop door-to-door, had a paper route, and saved enough from those earnings to buy 40 acres in Nebraska at age 14. Then he made more money renting the land. By the time he'd finished college, Buffett was investing everything he earned that he didn't need for food or housing. His early strategy was to buy stocks he thought would outperform the Dow Jones average by at least 10% annually, and they always did. This has since evolved into an investment pattern: Buffett focuses on well-established but under-performing companies, and often holds his stock for years or decades. 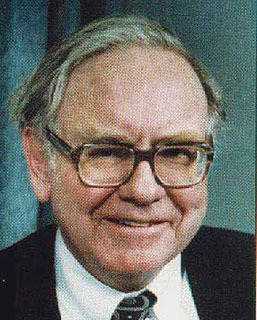 In the mid-1960s, Buffett took control of Berkshire Hathaway, which until that time had been a textile mill in New Bedford, Massachusetts. He soon sold the mill, kept the company name, and made Berkshire Hathaway an investment management firm. Since revamping the company, its book value has risen about 200,000%. These things can change rapidly, but as of 2004 Berkshire Hathaway owned substantial chunks of Coca-Cola, American Express, The Gillette Company, Wells Fargo, Wesco Financial Corporation (they're mostly in the furniture rental business, but also sell insurance and steel), Moody's (credit and debt ratings), The Washington Post Company, Koelnische Rueckversicherungs Ag (a German insurance company), PetroChina, H&R Block, Dairy Queen, Fruit of the Loom, Geico Insurance, The Buffalo News, Central States Indemnity Company, See's Candies, Ben Bridge Jeweler, and Acme Brick. Buffett never meets with his executives in swanky hotels at exotic locations. He prefers what are called "Berkshire barbecues", or invites favored managers to join him for a minor-league baseball game in his home town of Omaha, Nebraska. Experts snickered at Buffett during the late 1990s, as he refused to join the rush to invest in internet start-ups and high-tech companies. Several analysts wrote that Buffett was out of touch with the new economy, when he spoke with disdain of dotcoms where investors got rich through rising stock prices instead of profits. "The fact is that a bubble market has allowed the creation of bubble companies, entities designed more with an eye to making money off investors rather than for them." When the bubble burst, many investors were ruined. Buffett's profits doubled. Buffett and his wife Susan were married more than 50 years, but it was not a typical marriage. They separated in 1977, but still attended social functions as husband and wife, and she still sat on Berkshire's board as a major stockholder. She lived in San Francisco until her death in 2004, while Buffett and his paramour, Astrid Menks, lived together in Omaha. Susan introduced Menks to her husband, and they remained friends. When acquaintances received presents from the Buffett family, the card was often signed by all three of them. For nine years ending in 2001, Buffett hosted an annual golf tournament for celebrities, professional athletes, and CEOs, with all proceeds going to charity. It raised about $9M for four charities. The last such event was scheduled to be held at Offutt Air Force Base near Omaha, on 11 September 2001. They didn't end up playing golf that day, but the event did save the lives of at least a few CEOs who would have otherwise probably been at work in the World Trade Center. It's also fueled some conspiracy theories, because Offutt Air Force Base is the headquarters of the U.S. Strategic Command, "responsible for both early warning of and defense against missile attack and long-range conventional attacks". Buffett is believed to be the second or third wealthiest man in the world, and still lives in the house he bought for $31,000 in 1958. He drinks 12-15 cans of Coke daily. "It's dumb to let possessions rule you," says Buffett, noting that his children won't inherit any great wealth when he dies: "There's no reason why future generations of little Buffetts should command society just because they came from the right womb. Where's the justice in that?" Both Buffett and his wife have stipulated that upon their deaths, the lion's share of their wealth will go to the Buffett Foundation. The foundation provides scholarships for Nebraska kids who want to attend Nebraska colleges, but its largest donations go to reproductive rights and family planning groups. Buffett strongly supports abortion rights. Matthew Miller, Gates No Longer World's Richest Man, 5 March 2008.